You met a new friend through a friend. You think you like her, and maybe she likes you. Or does she? You start second-guessing, making assumptions, and what happens in the end? Nothing. So who is the 'right' one? How do I know it when he/she is right in front of me? 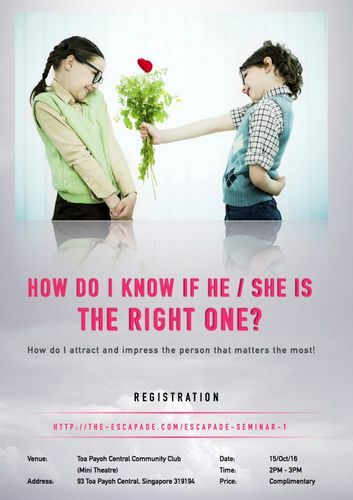 What do I then need to do to attract him or her? The Escapade is organising a workshop conducted by Lusi Lim. She has been named one of the most influential women in the region and is a highly sought-after life coach. People pay thousands of dollars to learn from Lusi herself. She has been featured on Women's Weekly, Lianhe Wanbao, and winner of the Ten Outstanding Young Persons TOYP Awards 2012. This is a rare opportunity to get up close to her and learn as much as you can. Catch her live in action and in person at this complimentary workshop. Seats are limited so sign-up fast! What can you lose other than 'the one that got away'?